See How High You Can Stack a Never-Ending Supply of Blocks! In a world filled with mobile games that try to cram as much detail and complexity as they can into a screen so small, one app aims to be as simple as it can get. 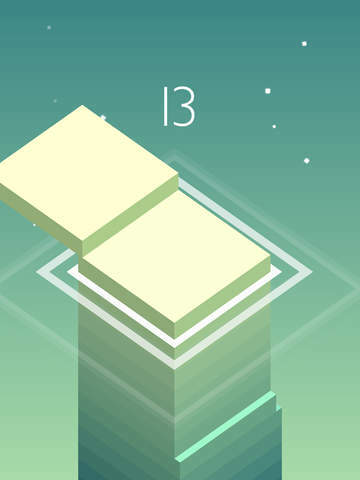 Featuring minimal but visually-pleasing abstract visuals, soothing sounds, and easy-to-learn one-tap controls, this is a game that just about anyone can play, but which will challenge you in all new ways. Its mission is this: to help you kill time during the most boring humdrums of everyday living. This app goes by the name of Stack and it's coming to an iOS or Android-powered device near you! Stack is so easy to grasp, so easy to learn, and so easy to play, that everything you need to know is right there in the title. There's no tutorial or learning curve to find here; just get ready to tap and you will be golden. Tap the screen to place the block on the stack when it's in the right position. Time it right to stack the block in its entirety. Be careful! Mistimed stackings will break the block up and shrink the amount of space you have left to stack. Stack forever until you miss a beat. See how high you can go. Then go higher! 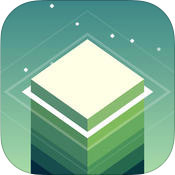 While Stack is a game first and foremost, you might be surprised to find it a relaxing experience as well, thanks to its simple mechanics and lovely minimalist graphics. Features randomized visuals and believable physics. Stack blocks that gradually change color. Listen to soothing musical notes with every perfect stack you make. If you want a simple no-frills game to help you pass the time while you're riding on the train or waiting in line, then Stack is the game for you. Its very simple and user-friendly design makes it a fantastic way to just kick back and let the minutes fly, but it will still challenge you in ways you never thought were possible. Ascend with Stack and see how high you can go! It is rare to find a game, let alone a mobile one, whose entire premise is stated and described in the title. It is even rarer to find a mobile game whose entire premise can be described in one word. However, that is exactly what you will get with Ketchapp's Stack. Stack is a game about stacking. You stack things in it. That is literally all you do. If it sounds like it may be a tad two-dimensional to you, that is because it is. However, there is still some fun to be found in Stack, and the developers certainly deserve credit for making something that somehow looks just so oddly pleasant. It cannot be repeated enough. In Stack, you stack. Your goal is to make as tall a tower as you can manage with an unending supply of blocks. 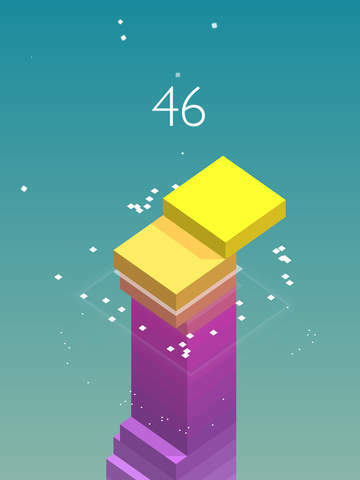 You do this by waiting for the block to slide over the tower, and tapping the screen so that it will fall in such a way that it will land on the topmost section of your stack. This is not a fast-paced game that tests your reflexes, as you're allowed to take as much time as you want. This is a game about proper timing. You ideally want to stack blocks perfectly on top of one another, for partial stacks cause the topmost block to break apart, which shrinks the size of the landing zone and makes it harder to put anything else on it. This goes on until you finally mistime your tap and put the next block on only empty air. Stack isn't hard to learn or play in the least; anyone with a good eye can take it on. It's a simple formula, but it can also be a strangely satisfying one, provided you take it in small doses. Stacking blocks perfectly isn't as easy as it sounds, and it gets even harder as they grow smaller. Get them thin or small enough, and it will take a miracle to stack anything on them at all. When you're done, things aren't over yet, for the app will then display the best score for your highest-standing tower, reminding you that you can always do better the next time you play. The visuals help the experience immensely. They, just like the rest of the app, are simple. There are no polygons to push here, no advanced shaders, no charming cartoony characters to get attached to, or lovely virtual worlds to behold. In Stack, the only thing you will ever see is an ever-growing tower made up of flat blocks and a nearly featureless background. It doesn't sound very exciting, now does it? You would think so, but the visual designers over at Ketchapp have found a way to make it work. Each block has a distinct color, and every subsequent block appears with a slightly different shade from the one that preceded it. As you stack more and more blocks together, the colors will gradually shift over time; you may begin a round with magenta, move on to bright pink, which fades to white, becomes more yellow, darkens to a blood red, and so on. This extends to the background as well, which will subtly change in hue over time. The way it can evolve from a light color to a dark color almost makes it seem as though day and night are passing while you play. The best part might be when your game ends; the camera will zoom out and give you a full display of how your tower looks with all the different colors. The whole thing comes across as a kind of interactive abstract painting. It helps that the animation in Stack is fluid and smooth. Blocks slide back and forth into position with nary a drop in frame rate. Perfect placement of a block creates a bright flash of light, while improper placements cause the overhanging sections of your block to fall down. These broken pieces fall in relatively realistic ways, rolling in the air and bouncing off the ledges of the tower. If there's enough space, then they may even come to rest where they fall. While the graphics of Stack may not represent anything real, they certainly feel real in their own weird way. Unfortunately, a few minutes of Stack is pretty much all you will need to see what the game has to offer. There's no rising challenge, there are no new skills or things to unlock, and the strategy remains the same from beginning to end. No amount of playing is going to show you anything different. It might give you a couple of amusing minutes, but you'll likely fall asleep if you play the app for any longer than that. In general, Stack would probably work better as a kind of multiplayer game. Play it, see how high a score you can make, then hand your phone over to a friend and see if they can do better. The slight competitive element can add a lot of spice to the package, but Stack just doesn't have enough material to work with on its own. Ultimately, Stack is a pretty ho-hum package. It's inoffensive and doesn't really do anything wrong per se. It knows what it wants to do, and it accomplishes it fairly well. It even manages to look pretty good for all it minimalism and simplicity. It just doesn't have much else to offer besides its core mechanic. By all rights, feel free to download Stack and see if it clicks with you. It's completely free, with only a few unobtrusive splash page ads to look at between the occasional game. Just don't expect any more than that.